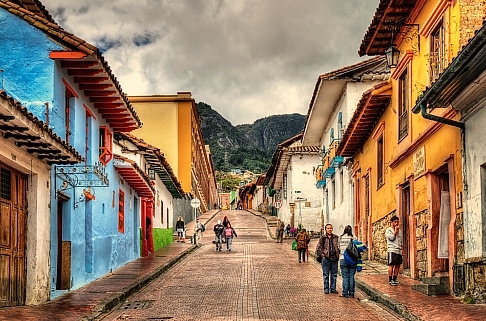 Aeromexico has dropped the price of their flights from Vancouver to Bogota, Colombia down to $479 CAD roundtrip including taxes. Summer dates are available (July, August). Try starting with a Wednesday to Wednesday or a Wednesday to Monday/Tuesday date search in one of the months listed above. NOTE: After your Flighthub search completes, click on 'Flexible Dates' to potentially see a lot more dates for a similar price. This option is not available on the mobile site. - Look for the dates with about a 4-5 hour layover each way. You may also see options with a 90 minute layover. This can be a really short connection for Mexico City airport, which tends to take a while to get through. - It may be harder to find dates with decent layover lengths in certain months, such as July or August. 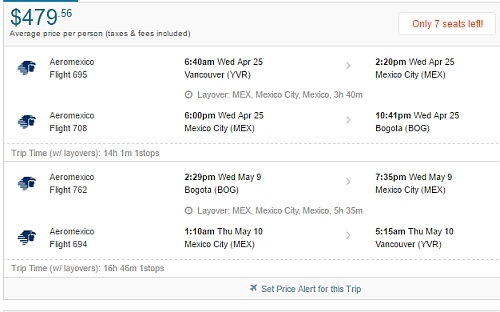 vancouver, yvr, flight deals, south america, bogota, colombia, bog and aeromexico. 3 Responses to "Vancouver to Bogota, Colombia - $479 CAD roundtrip including taxes | spring, peak summer, and fall travel"
Looking forward to your next deal. I’m in need of something at the end of February, for a week. Keep checking your page. Thanks ! Going in November! Thanks Chris! Nice! No problem Heather, have a great time. And thanks Ryan, I hope something comes up that works for you.